Pippoglyph Playing Cards mark a return to the print medium for Ben Crenshaw showcasing his dynamic graphic designs in a format that may seem entirely new to those familiar only with his jewelry. Inspired by Celtic art and illuminated manuscripts his original interpretation of the standard deck of cards is already a favorite with card players, collectors, and magicians. An avid card player since learning the game of bridge from his grandfather as a child, for Ben creating the Pippoglyph deck was a labor of love. Working with the familiar playing card iconography and respect for the traditions of card players he set out not to invent a new deck but to breathe a fresh life into old friends. His lavish reinterpretation of the classic court cards and suit pips are graceful and elegant without sacrificing practical playability. Direct comparison alongside any common playing card reveals that all of the essential features of a deck have been maintained and aesthetically expanded. The customary suit symbols have been elaborated from simple spots to refined sigils, bringing Ben's attention to detail through the entire deck down to the lowest number card. The regal courts are clad in patterns based on their own pips that emphasize their suit relationships. The deck retains familiar favorites, such as one-eyed Jacks and a suicide King. The plush style of Pippoglyph playing cards wraps all the way around to their backs. Like a matching tapestry the backs incorporate the elegant pips that are the hallmark of the deck's design. The first edition decks feature a heart and diamond patterned back. A spade and club back has also been designed but will have to wait until our second edition sees production. 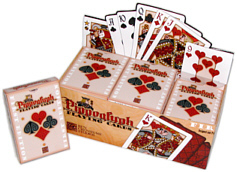 If you would like to carry Pippoglyph Playing cards in your store we offer bulk and wholesale pricing. Full color boxes containing a dozen decks are suitable for counter display with a decorative die-cut fold back lid. Decks are in cellophane wrapped full color flip boxes and are barcoded for individual sale. Recommended retail price is $5.50 per but boxes are unmarked so vendors may price at their convenience. Looking for unique promotional items? With a minimum order of 2500 decks customized cards are available pairing our original Pippoglyph faces with your business name and/or logo on the full color backs and boxes. Contact knot@enchantedglyph.com for more information.